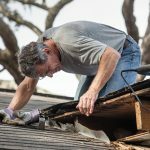 If you live in a storm-prone area, chances are you’re familiar with the sight of roofers repairing storm damage. 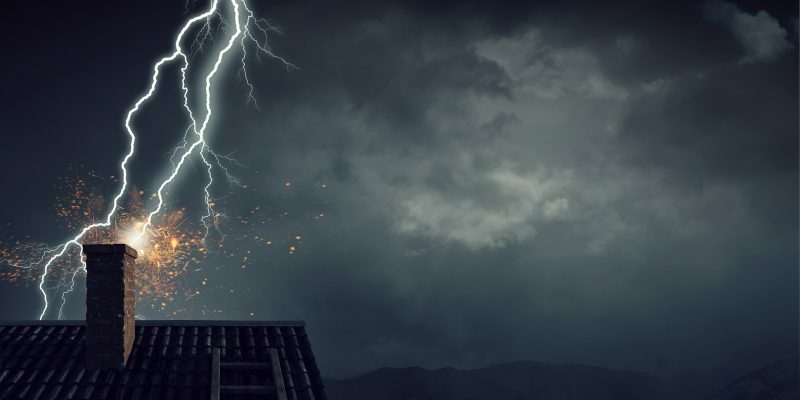 Whether it’s in the southeast, where hurricanes dominate the summers, or in the midwest, where tornados are a springtime staple, storm damage to your roofing is a very real danger. 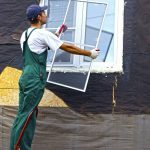 You want to ensure that your roof stays in good shape. Not only is it costly to replace, but it is the one factor of your home that is arguably most important. It protects you from the elements and ensures that the other parts of your home, from climate control to lighting, function the way they should. Ignoring the well-being of your roof is a costly mistake. But short of your roof actually being ripped off, how do you know that you need storm damage repair? Call Davis Contracting for your repair needs! Hail acts a projectile, hurling balls of ice at your roof. These ice balls can be anywhere from pellet sized to the size of small melons, depending on the updrafts going on during a particular storm. Hail can cause damage to shingles, gutters, chimneys, and can even put holes in your roof, especially if you’ve had prior damage. Heavy rain is unlikely to soak through your roof unless you’ve had previous damage that has gone unchecked. If your house has been through multiple storms without storm damage repair or a roof replacement, heavy rain could become your enemy. Moisture will seep in through tiny cracks made by hail or high winds, and while you may not see an actual leak, water can accumulate in your walls and ceiling, causing swelling, structural instability, and mold. High winds like the kind you find in hurricanes and tornados can rip shingles from rooves, and, if the winds are high enough, tear a roof clean off. 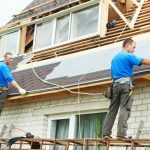 High wind is also the cause of external damage and can be the cause of fallen trees or other projectiles slamming into your roof. If you’ve had a storm with any of these factors, and especially any of them in conjunction with one another, you need to check for roof damage. We have the four signs to look for. Water causes incalculable amounts of damage to rooves and homes every year. Left unchecked, water damage can cause issues with swelling and mold. Obviously, if you have a leak, you probably have roof damage. But leaks can be hard to spot, especially if you have an attic or crawl-space. After a storm, you should take the time to walk the uppermost space of your home and check for leakage. If you find puddles or water spots on your ceiling or walls, it is time to call a roof specialist. You don’t have to get up on your roof to assess whether or not you have missing shingles. And in fact, you should never walk around on your roof unless you are a professional. There is no need to add bodily injury to your list after a large storm. Walk your property after a storm and keep an eye out for pieces of your roof littering the ground. Even one or two missing shingles is cause for calling a professional. 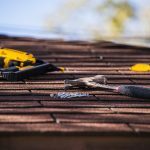 You may be tempted to just DIY it if the job doesn’t seem too big, but your roof is an investment, and you don’t want to compromise its integrity just because you don’t want to pay a professional. Now it’s time to head up to your roof, especially if you’ve had hail. It’s best not to walk around on your roof, for safety’s sake. Use a ladder and take a cursory look. If you feel like you need a more detailed examination, call a storm damage repair company. Check for missing shingles here, even if you didn’t see any on the ground. Also, take a close look at your shingles. Look for any cracking or dimpling caused by large pieces of hail. Many homeowners make the mistake of thinking that a small ding from hail is no big deal. After all, there’s no hole and no leak. But even tiny imperfections compromise the integrity of the shingle and can erode over time, leading to leaks and water damage. While you are up on your roof checking for hail damage, take a look at your rain gutters, downspouts, and chimnies. Damage to any of these components may indicate damage to your roof that you are unable to see, especially if you have had high winds or hail. Keep an eye on your air conditioning unit as well. If it took substantial damage in a storm, it’s likely that you need a professional to look at your roof as well. There are a few other, more obvious signs. For instance, if there is a tree on your roof, even if it hasn’t broken through, you need to call a professional. Under no circumstances should you attempt to move a tree off your roof on your own. You also should not remain in your home if there is a tree on your roof. Get out as quickly as you can and call a storm damage repair company. If your home has taken storm damage, see how we can help you out. Contact us today!